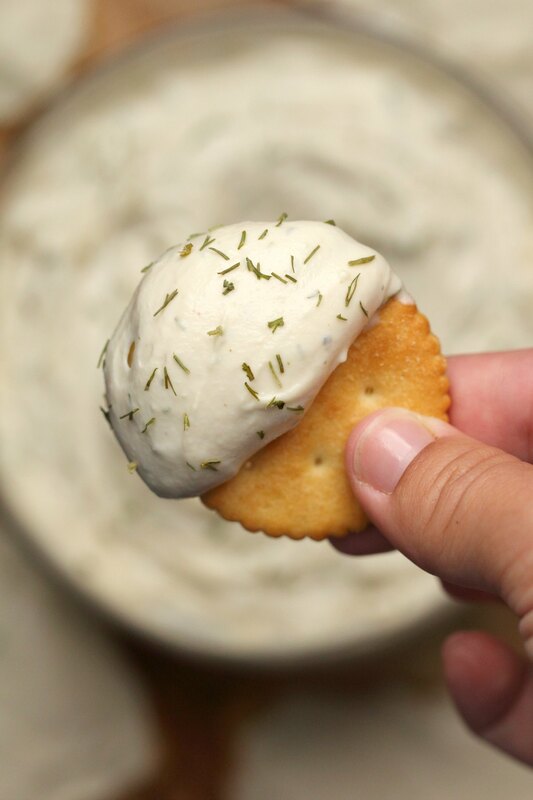 Deliciously creamy and cheesy vegan cream cheese! 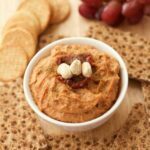 This super easy recipe is divine spread on bread or crackers and ridiculously close to the ‘real thing’! 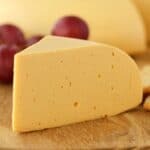 I suddenly realized that while we’ve made a lot of different vegan cheeses for this blog, we hadn’t yet made a vegan cream cheese. So I had to get to work on that! 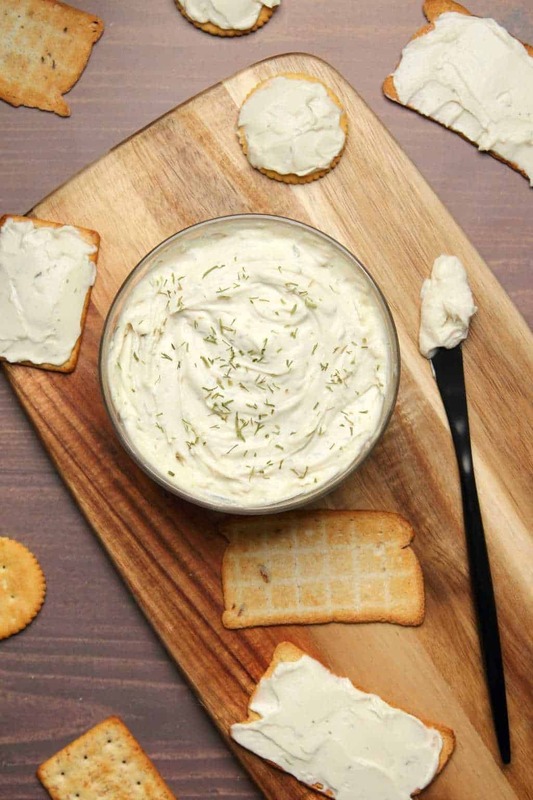 This vegan cream cheese is simple but seriously good. You will impress yourself with how good this is and you will definitely impress all your guests with it too. We have tried this out on some non-vegans and the response has been extremely positive! So this is a win for vegans and non-vegans which is a really good thing in my view. 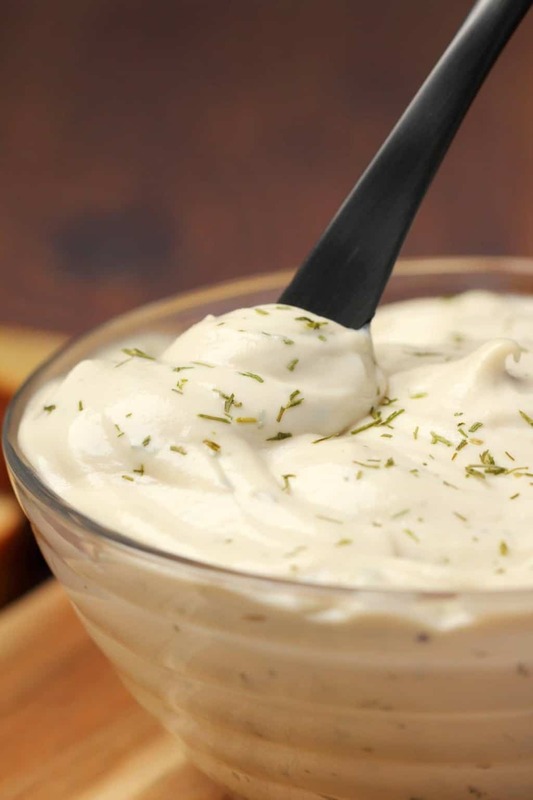 It is extremely delicious served in all the usual ways, on breads, on crackers or on bagels! The full recipe is in the recipe card at the bottom of the page, but here’s a quick rundown and some extra tips. Soak some cashews in boiling water for an hour. I’m a fan of this method because you don’t have to try and remember far in advance that you want to make some vegan cream cheese! As long as you have a bit more than an hour of lead time you can make it work. So soak them for an hour in the boiling water and then drain them and add to a blender with some lemon juice, coconut cream, white vinegar, salt and onion powder. Blend. Stir in some dried dill. Done. You can use it right away, or you can just put it into a container and keep it in the fridge. It firms up a bit more in the fridge so if you prefer a firmer texture, then it will be just right for you after it’s spent some time in the fridge. But right after blending, it’s ready to go as well. The dried dill is optional and you can switch it out for some fresh chopped chives or dried chives or dried basil or anything you like. I really love the flavor of the dried dill with this so as soon as I tasted it I was like: this is it! Okay, so…I’ll admit I don’t always soak cashews in my recipes. This might seem inconsistent and maybe it is. But I reckon in this recipe it is important to soak them. The reason I think so is that for one thing, you’re creating a really thick cream cheese here. It’s hard to blend without making it easier by soaking the cashews first. 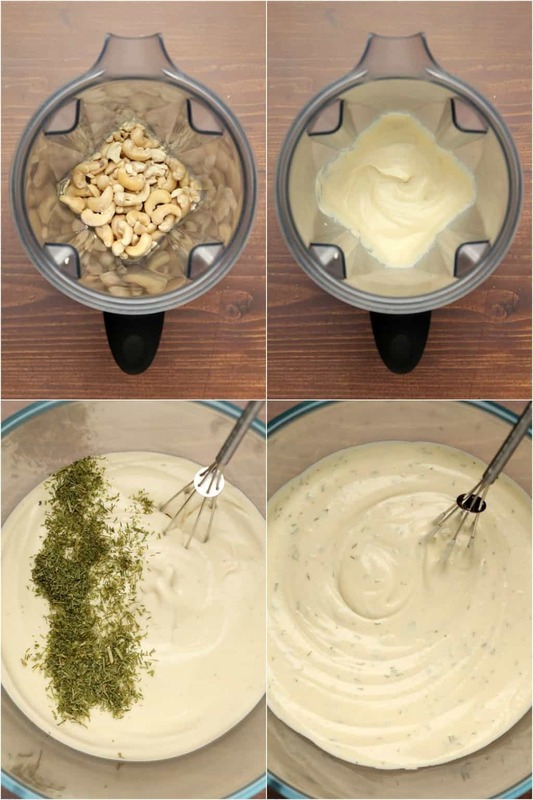 Then, you’re also wanting a super creamy texture here and soaking the nuts does contribute a little towards that. And then I don’t know if it really does, but I think it helps with the color a little too, keeping it nice and light in color for that perfect cream cheese ‘look’. It’s actually quite amazing that such a simple ingredient list can have such great results. The cashews create the creamy base for this recipe. Lemon juice gives it the tang, which is the basis for the cheesy flavor. Coconut cream (full fat, from the can) adds creamy flavor and texture and also contributes to the beautiful white color. It also helps it to thicken up nicely once it’s in the fridge. Note: You do not need to refrigerate your coconut cream first and it does not need to separate, just shake up your can and then pour out the right amount. 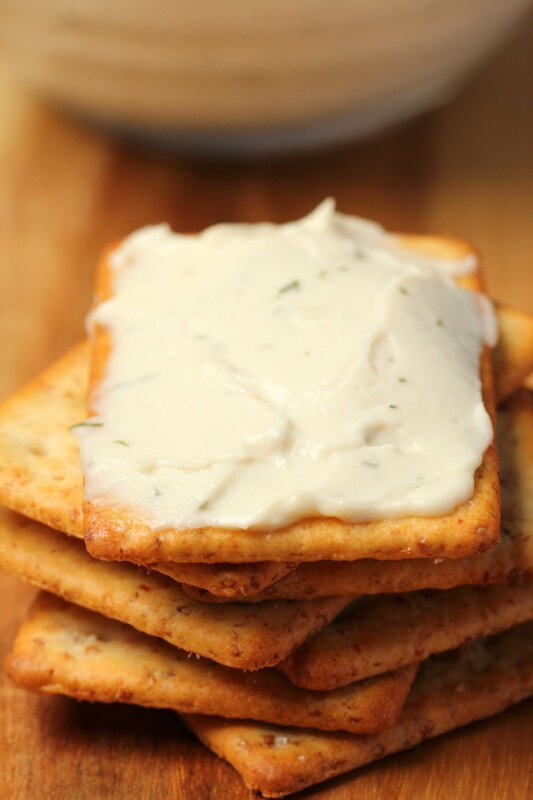 White vinegar, onion powder and salt take it the rest of the way to creamy cheesy perfection. Every ingredient in this recipe plays a big part and all are crucial to the result. If you want to add more flavors to this, like some garlic powder or fresh garlic or something like that, do it! But I wouldn’t take any of the flavorings away or it will be too plain. Can I use another kind of nut other than cashews? Cashews really work best for this. They create that smooth texture. Different kinds of nuts will create different textures, which may still taste great and can work well for different things, like almonds work super well for vegan ricotta (recipe for that coming soon!). Can I use something other than coconut cream? 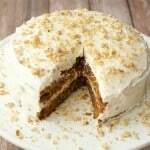 As mentioned above, the coconut cream helps with thickening and also making it extra creamy. That being said, we did try a version of this using water instead of coconut cream and it still worked! It was just thinner and didn’t thicken up as nicely in the fridge. So you can use a non-dairy milk or a different kind of non-dairy cream or even water and it would still work in this recipe. Can I make this in the food processor? If you don’t have a blender and all you have is a food processor, then sure. It will not come out as smooth as this though. It will have a grainy texture. Not necessarily bad, but smooth is better. So if you have a blender, then a blender is definitely the preferred option. A high powered blender like a Vitamix (my favorite) or Blendtec is of course going to work best. The Vitamix is especially great because it has the tamper (stick) attachment and that really helps with this recipe as you can push down from the top which really helps the process. Can I use apple cider vinegar instead of white vinegar? No. The white vinegar really creates magic here with the flavor. It really does. Apple cider vinegar will work in a pinch but it is not going to be nearly as good. Seriously. You want a white spirit vinegar (also called distilled vinegar), it really works magic in this recipe. Can I freeze it? Yes you can. Can I use this in a vegan cream cheese frosting? Not in its current form no, but with some adjustments yes! 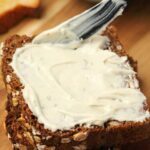 Check out our vegan cream cheese frosting recipe that uses an adaptation of this recipe as its base. The flavors that work so well for this in a savory form really clash when you try and add sweetness to it so it has to be adjusted, and then it works great. Keep it stored in a container in the fridge and enjoy within around 5 days. We have the goods for you! 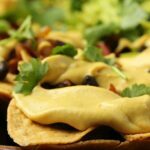 Our vegan nacho cheese is divine as a dip or poured over nachos (of course!). 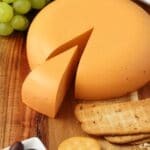 Our vegan cheddar cheese and sliceable cashew cheese are both firm cheeses that you can put on a cheese board and cut into perfect slices! 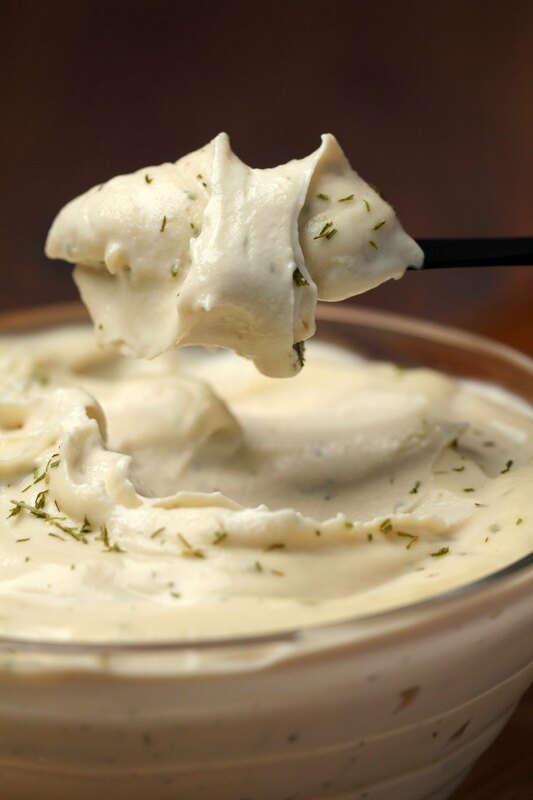 Our vegan cheese sauce is a perfect sauce for a vegan lasagna, it’s like a bechamel sauce but just flavored to be cheesy. And then our vegan mozzarella and vegan ricotta are both divine on pizza! 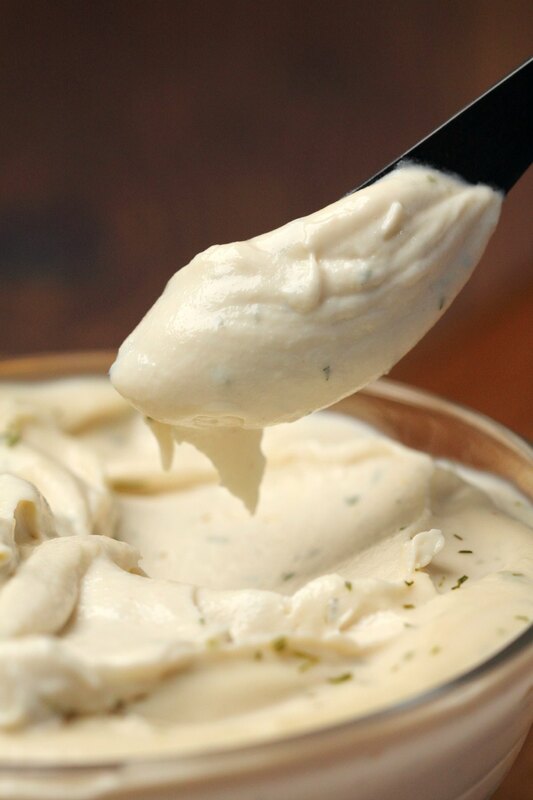 Our vegan cashew cheese sauce is the perfect sauce to drizzle over a baked potato or over your pizza slices. And then some vegan parmesan cheese is just divine sprinkled over anything and everything! 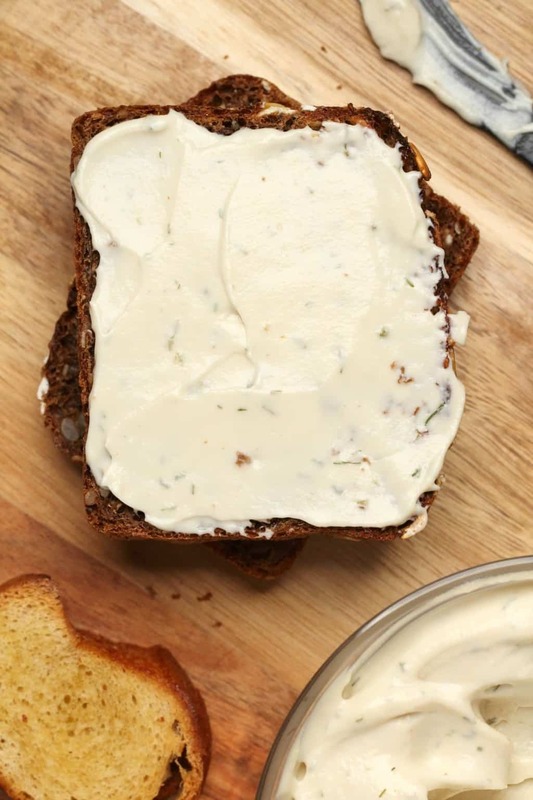 So let us know what you think of this cream cheese recipe in the comments and please do rate the recipe too, thanks so much. Sign up to our email list to stay updated with all our latest recipes posted to the blog and we’ll also send you a gorgeous recipe ebook containing 10 delicious vegan dinner recipes. Add the soaked cashews (drained) to the blender jug along with the lemon juice, coconut cream, white vinegar, salt and onion powder and blend. If you have a stick attachment with your blender then use this to push the cream cheese down onto the blades making it easier to blend. If you don’t have a stick attachment then stop regularly and scrape down the sides and give it a stir and then continue until it’s very smooth. Transfer the blended mix to a bowl and then add in the dried dill and stir or whisk it in. * Your cream cheese is now ready to use. Keep it stored in the fridge. It will firm up overnight in the fridge so will have a firmer texture on day 2 vs on the day you make it. *Weigh the cashews for the most accurate result in this recipe since cup sizes can differ around the world. *I place the cashews into a bowl and then pour boiling water from the kettle over them. Then just cover with a cloth and leave for an hour to soak. 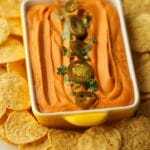 *The dried dill is an optional add on, but it adds a lot of delicious flavor so is recommended. You could use dried chives or dried basil instead (in the same quantity). This looks wonderful, but I can’t have nuts when I have carbs. Is there any way to make this or something similar without nuts? I don’t do coconut milk/cream because of the saturated fat. Will any other plant milk work, or is the saturated fat the reason this sets up so well? First let me say that I love your website!! I went from vegetarian (about 3 years ago) to vegan about a year ago (and I’m no spring chicken!). Since stumbling on your site, I no longer buy processed vegan cheese, condiments, etc. 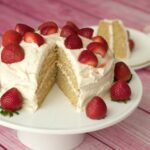 I came across this recipe and am in the process of making it. I already made your recipe for butter, cheddar, garlic aioli, zucchini patties and a few others and they already made it into my book of “keeps!” Everything is delicious – I even fooled my non-vegan family:) Thank you. This is wonderful to hear, thanks so much Deborah! Thank you again Alison, another great recipe it’s delicious. Can this recipe (omitting the Dill) be used for baking in a sweet dish? 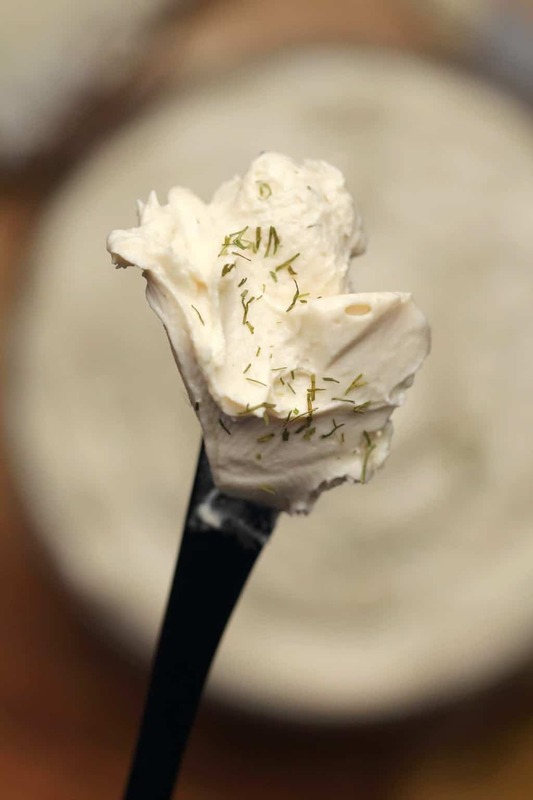 Hi Dawn, as I discussed in the post, I tried using it (minus dill) to make a cream cheese frosting and it was not a success, the flavors were too much of a clash. But with some adjustments, like removing the onion powder and reducing the white vinegar, then it can possibly work, it depends on what you’re making. 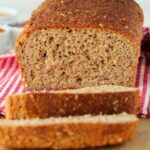 Ich habe es zwar schon mal gesagt aber ich muss es schon wieder sagen, ich liebe deinen Blog und bin total glücklich das du auch Gramm Angaben für deine Rezepte machst, DANKE DANKE DANKE! Ich bin Männlich auch wenn viele denken ich bin wegen meines Namens eine Frau. Made this last night and am super impressed. It set up well overnight and spread on a slice of toast with some sliced green olives, was so yummy. Now to be brave and put part of the recipe in the freezer as I can’t eat that much in five days. Thank you. I enjoy your website so very much! It is a thrill to eat “cream cheese” again; along with so many other favorites of mine. You both are appreciated! Well, I had to come and tell you that I made this for some friends who aren’t at all vegan, they’re also French (I live in France) and they loved it… they’ve asked for the recipe :)) So I gave them your link, hey, maybe they’re reading this right now! ;D I’d definitely make this again. Oh wow! 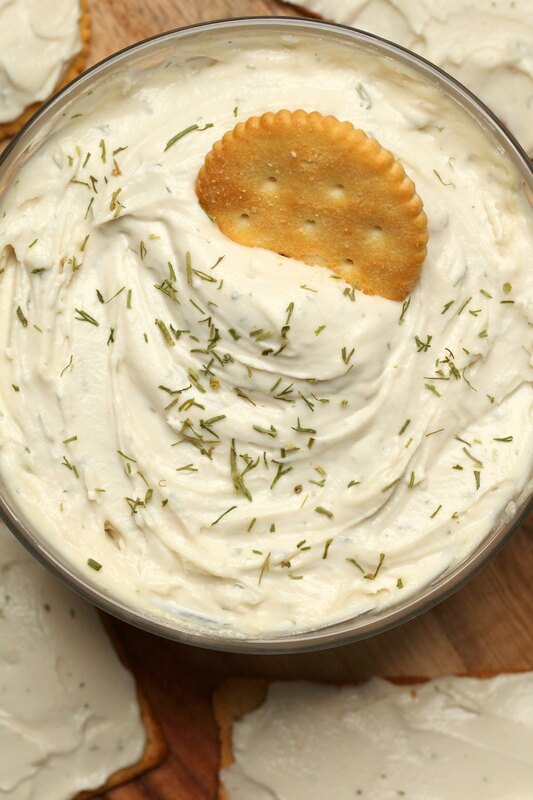 This is by far the best recipe for vegan cream cheese in my humble opinion. It’s creamy and very tasty. 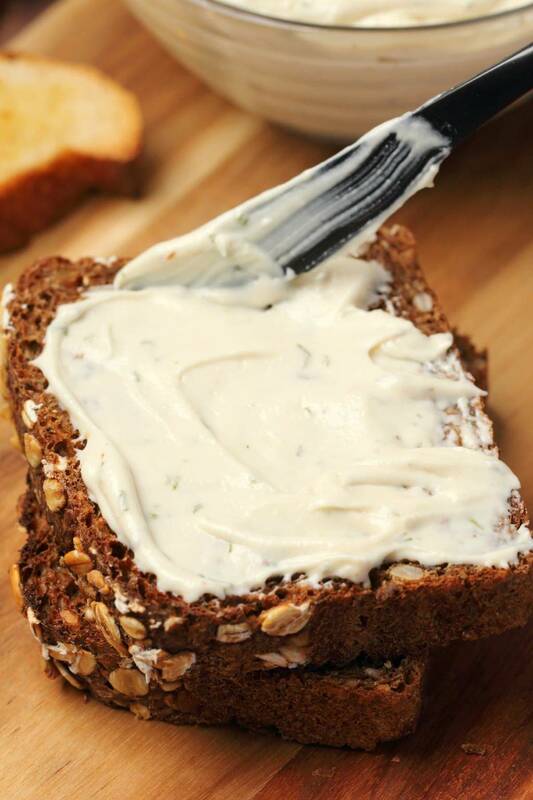 Needs to be spread on a cracker or slice of bread worthy of its deliciousness! So glad I found your site it’s top notch, love it! This recipe is AMAZING! I think I would serve this to dairy-eating people and they wouldn’t know the difference. 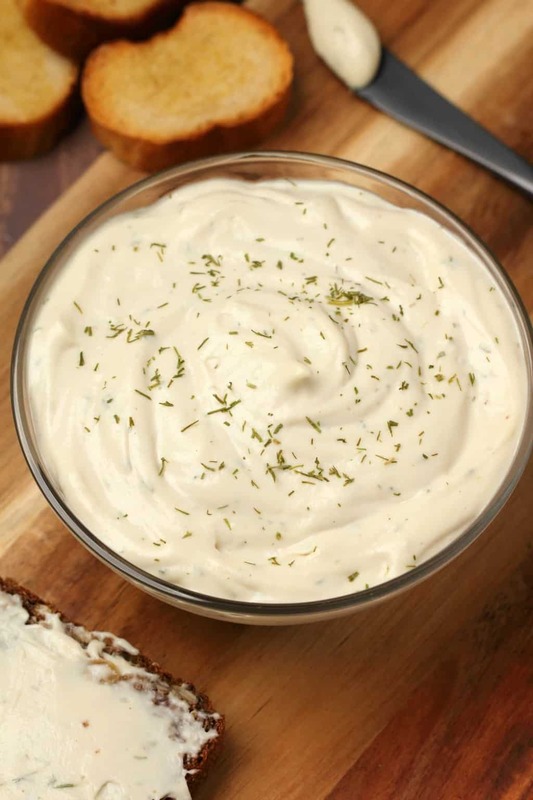 I made herb & garlic “cream cheese” to go with my homemade everything bagels. It’s drool-worthy. Thank you so much for bringing bagels with cream cheese back to my life (I have a new dairy allergy). 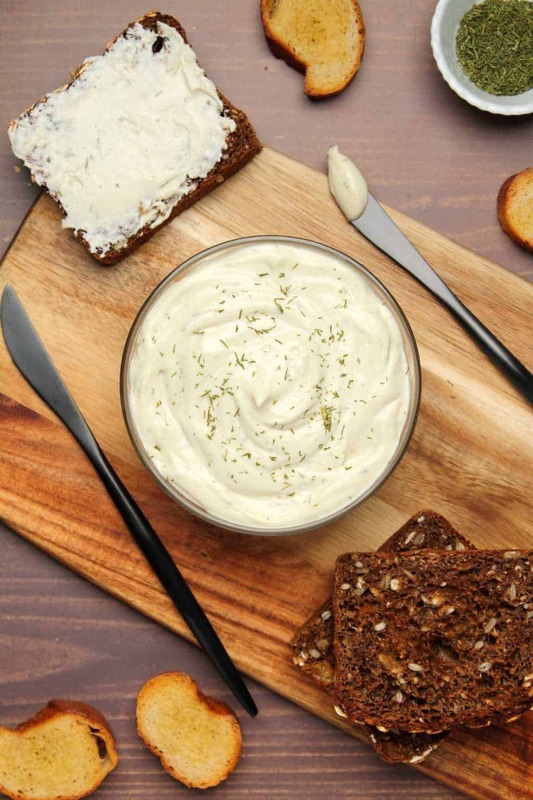 This cream cheese is so much more tastier and more delicious than the ones in the shops. Constantly making it and telling people about how good it is.